4 tbsp chopped coriander leaves. 2. Cut out florets from the cauliflower head and wash them clean. In a large pan boil water and when it comes to a boil add the cauliflower florets, cover and switch off the flame. Let it sit for 10 minutes after which drain the water completely and grate the florets finely using a grater. Line a muslin cloth over a strainer and place all the grated cauliflower over it. Squeeze out as much water from the cauliflower and set aside. Discard the water. 2. Heat a pan and add oil. When the oil is heated, add the cumin seeds, hing, minced green chillies and grated ginger. Add the squeezed grated cauliflower and all the spices and seasoning. Give the mixture a good stir. Add chopped coriander leaves and mix again. Heat it for another 2-3 minutes and then turn off the gas. Take the pan off the gas and let the mixture cool completely before using them to fill parathas. 4. Using some dry flour roll the dough ball into a roti about 3cm in radius. Place 3-4 tbsp of the prepared filling in the middle. Join the edges and close it forming a ball. Roll it again about 6 cm in radius. I like the way you prepared these. With cauliflower I usually roll out two rotis and place the filling in the middle. Addition of ginger to the filling is very interesting. 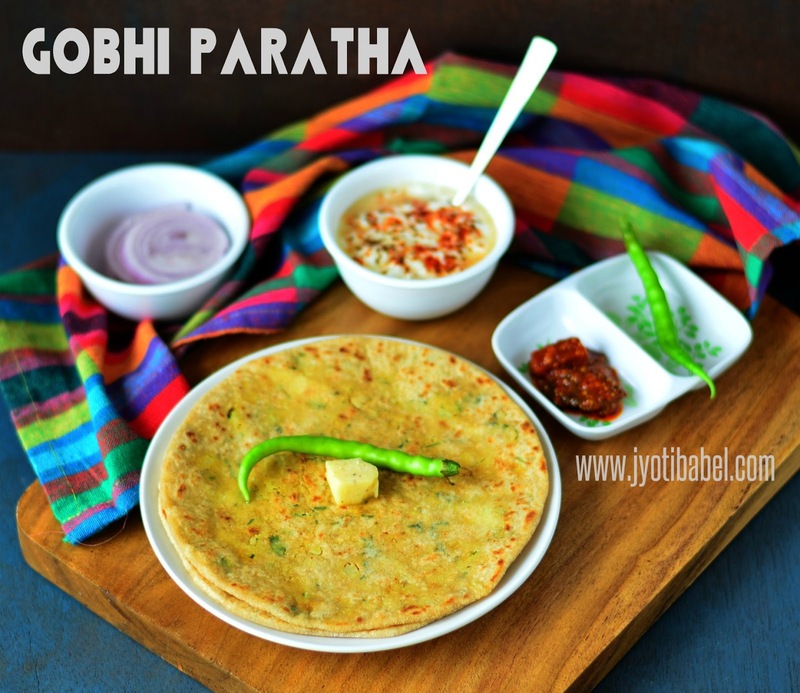 Your Gobi paratha looks so yummy!..lovely presentation that makes one want to grab it right away. I generally love all stuffed parathas and I have two versions of gobi..this is indeed a great way to have either for breakfast or dinner!..good one! I love stuffed parathas and the number one in my list is aloo. But I have also tried various stuffings and this gobi one is really good. You have made it perfect. With the cube of butter on top, it looks so inviting..
Oh Yum! I want to eat some Gobhi Paratha right now. Looks so perfect and I want to dig right in! How prefect those gobi parathas looks, you nailed it prefectly Jyoti and love to finish that plate rite now. Drooling over here. Perfectly made gobi paratha and looks tempting. The whole setting looks so inviting. 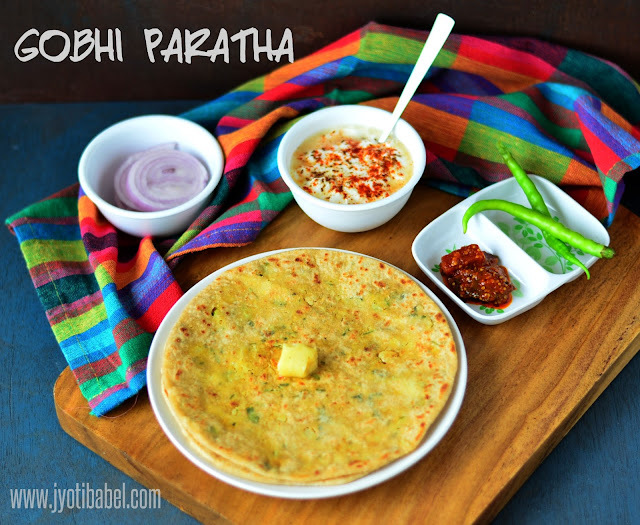 The gobi parathas with that pat of butter, raita and pickle looks very delicious. This Gobhi Paratha is quite different from the way I make , I keep the cauliflower raw , but a sautéed one would taste different , let me give this one a try too , sounds pretty interesting . Beautiful looking parathas. Love the stuffing as well. Gobi Paratha looks so inviting. Lovely presentation and pic too Jyoti! 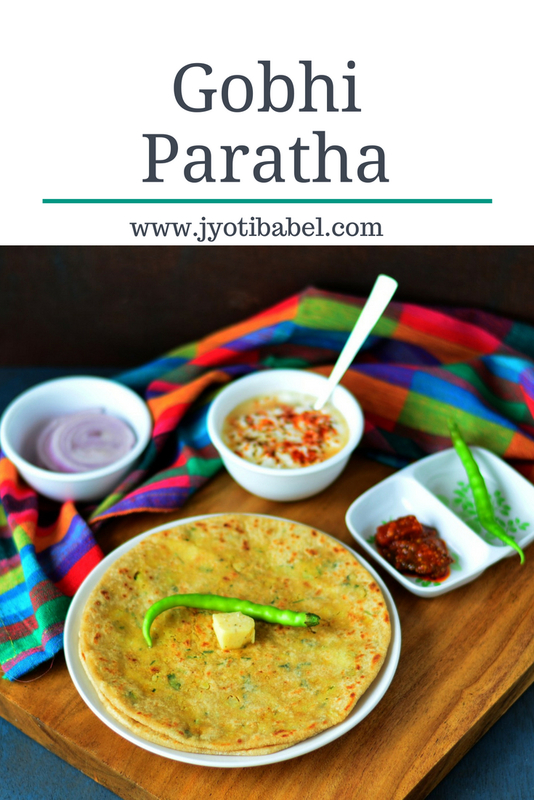 Pass me that plate .. Beautiful paratha with a delicious filling.. Such a nice parata Jyoti. You have presented it really well! We prefer stuffed one to plain roti as they are more filling and flavorful!